A real image of Xiaomi’s upcoming phone, the Mi 6 surfaced online today. While it doesn’t reveal much info because its heavily blurred, we can make out the design of the dual cameras. Phones with dual cameras usually follow one of two main designs. The cameras are either stacked on top of each other in the middle of the phone or placed at the top left corner of the phone. Then you might see slight variations such as spacing between both sensors, position of the LED flash, and if the cameras share a single housing. For Xiaomi’s Mi 6, we see they have settled for the second design. However, what is unusual about the setup is the position of the LED flash. Usually phones that adopt this design have the cameras sitting at the edge and the LED flash beside them but in this leaked image, the LED flash comes first before the sensors. These image confirms previous leaks we have seen including the recently leaked silicone case. We can also make out the reflective surface of the phone but its hard to tell if the material is glass or ceramic. Apart from the leaked image we also get a first look at a teaser poster. 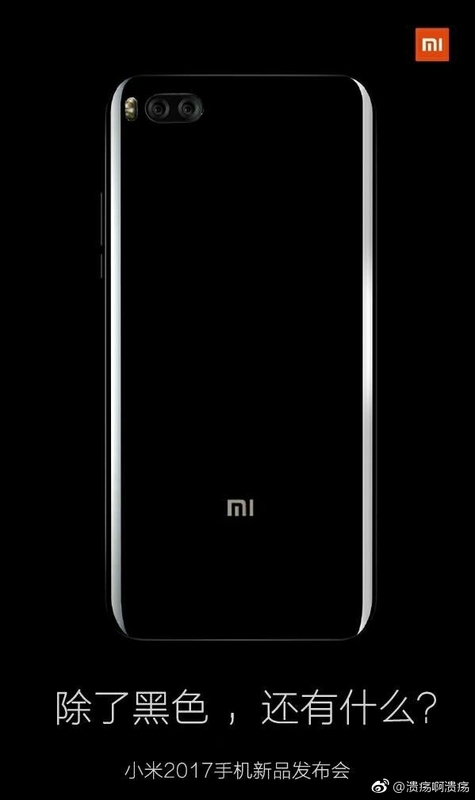 The image shows the Mi 6 with the same dual cameras and LED position. At the bottom of the poster is a text that translates to “In addition to black, what else?”. Is Xiaomi teasing other color options? We can’t tell. The Xiaomi Mi 6 will be available in two variants: a 5.15-inch and a 5.7-inch version. Both versions will come with Qualcomm’s Snapdragon 835 processor and will have either 4GB or 6GB of RAM.